…And we are all ears and ideas. 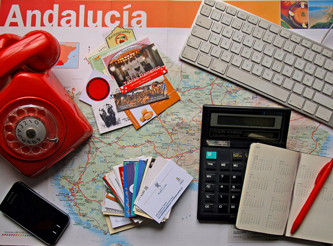 Once you place an enquiry, we will adapt to your preferred contact method (skype, telephone or email) to find out all about your dream trip to Andalusia. We will study your preferences carefully to which later we will send you a custom itinerary adapted to your wishes. We have a few travel bags filled with local expertise, empathy and hundreds of beautiful places and experiences to share with you in Andalusia. We will then remain at your disposal to provide you with as much additional information as you need, answer all your questions and fine-tune every detail to suit your expectations. After getting your confirmation of the itinerary, we will manage all the planning for you in order to have everything ready before welcoming you in Andalusia. You will make the most of your time and money both before and during your trip. You won’t have to spend hours looking for information on what to see and do, how to get to places, finding out about food or doing research on specific accommodations matching your preferences. Having a private tour organizer is an extremely smart and convenient way to plan a holiday tailor-made to your interests and objectives. Once you arrive in Andalusia, you will enjoy the reassuring feeling of having someone to take care of you and show you around. Your Personal Tour Organizer and Guide will have the sole objective of making you and your party have an unforgettable time in Southern Spain. You will get to see, learn and experience much more than you would be able to do on your own. Invest your time and energy in enjoying Andalusia, discovering its culture and observing its pace comfortably. Relieve yourself from the stress of driving, finding your way and parking. Save time having someone knowing the quickest and most beautiful way to get to your selected destinations and accommodations. 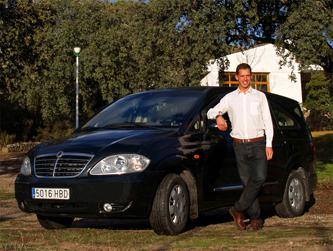 Relax and breathe Andalusia while you’re driven by a professional driver and guided by an educated and caring local expert. As your Personal Tour Organizer and Guide plans things for you, is driven with you and guides you, they can get a deeper sense of your personality too so they can also suggest adding little unplanned activities along the way. Flexibility and spontaneity are two factors that we consider essential in a discovery journey through Andalusia. If you would like to contact us, you can do it here. We’d be delighted to help you plan your dream trip to Southern Spain.